Macmillan Racing’s 2017 British GT Championship got off to a busy start at Oulton Park, on Bank Holiday Monday but wet weather and technical issues didn’t prevent a decent points haul. Rain on a Bank Holiday Monday rarely comes as a surprise to British race fans and a drizzly start to the day’s racing meant that everyone would be happy to survive the first of two races at the fast but tricky parkland circuit, near Tarporley in Cheshire. After a fine qualifying run from Jack Mitchell on Saturday, the team’s new Aston Martin Vantage V12 GT3 lined up in third spot on the grid for the first Round of the Championship, with Jack behind the wheel, eager for his GT3 debut. Unfortunately, as the field started to pull away on the warm-up lap, the no.24 Aston was dramatically engulfed in clouds of steam. The car was pushed off the grid and back to the pits, where the Macmillan AMR crew set to work. A blown water hose meant the first race was a write-off but organisers gave permission for the team to take to the track late in the race, to ensure repairs had been properly made and the car would be ready for Race 2. 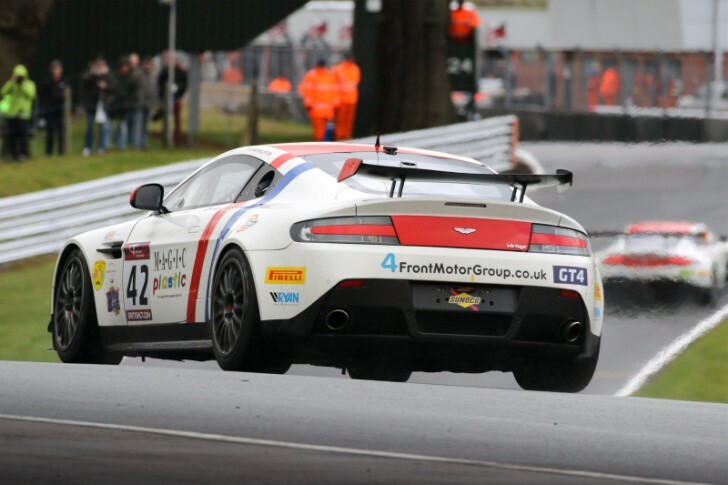 In GT4, the no.42 Aston Martin Vantage V8 started from 4th on the grid, with Will Phillips at the wheel. A good getaway saw Will grab third place in the charge through the first few corners, before he was hit from behind at the second chicane and knocked into a long spin on the soaking grass, that dropped the Aston way down the order and cost Will’s assailant a penalty. The GT4 team finished in 4th position, after their assailant on Lap 1 was excluded, claiming second in the Silver drivers’ points as well. A decent start to the season and – critically – the car was still in fine fettle for the second race. The afternoon’s second race saw the no.24 GT3 Aston line up in 6th position. James Littlejohn took the start, and in the drier conditions, kept his place in the top 6 all the way through his stint. It was not without drama, though, as the Aston was clattered at Lodge Corner by Seb Morris – despite James leaving the fast-approaching Bentley plenty of room to get by, as the Welshman recovered from a crash, a penalty and a spin! “All we wanted to do was score points, after Race 1’s disappointment,” reckoned James, “so my plan was to stay out of trouble, especially as half the track was dry but the other half was still wet. “I saw Bentleys off the track but when Seb Morris came up behind me, I didn’t know he’d had a penalty. He was closing at quite a rate, so at Lodge, I decided I’d let him go… I kept as far over to the left as I could and braked a little earlier. To my surprise, he side-swiped me and I had a big moment, gathering the car back up. Jack Mitchell finally got his chance to complete some racing laps, exiting the pits in 6th, clear of a tight battle, further down the top 10. “I was really looking forward to getting into the car,” said Jack. “Even though we’re carrying a lot of ballast – because we’re both Silver-rated drivers – the car has great balance and I felt sure we could make some progress. “Not long into my stint, though, the Safety Car came out. When I came out of the first chicane, it looked like a plane crash at the top of the hill, with cars and debris everywhere. After a couple of laps, they brought out the chequered flag, bringing things to an end, which was a shame, as I’d just set the fastest lap and was really into the groove. Jan Jønck lined up in 8th place in GT4 for his first GT start and made a clean getaway. Among the very last of the stoppers in the 10-minute pit window, Jan handed the car over to partner Will Phillips in third place in GT4, allowing his more experienced team-mate to try and grab a podium finish. Shortly after Will had taken over the car a huge accident, between a pair of GT3 cars, forced the organisers to scramble the Safety Car. Both drivers involved were OK but significant damage to the safety barriers led to the race being curtailed almost 15 minutes early. Unfortunately, the no.42 was among a number of cars penalized for pit-stop infringements, handed a 30-second penalty that dropped them down to 8th spot in the final reckoning. “We knew Oulton Park wasn’t going to be easy,” said Team Principal David Macmillan, “and when Monday dawned grey and wet, that just raised the stakes. I know we were not alone in prioritizing taking points and sustaining as little damage as possible, given the weather and the nature of the Oulton track. “The races proved exactly what we thought during winter testing – that we’ve got two good cars and two very strong driver line-ups… that’s really promising for the rest of the season. The team is all-new this season and I know the boys and girls on the crew are mortified with the two slip-ups but they weren’t alone in making mistakes – we’re all human. Round 3 of the British GT Championship is at Rockingham, Northamptonshire on Sunday 30th April.